The SystemBuild Kendall 16” Storage Cabinet is perfect for small spaces. The tall height and narrow width allow you to store items from top to bottom, saving valuable floor space in your home. 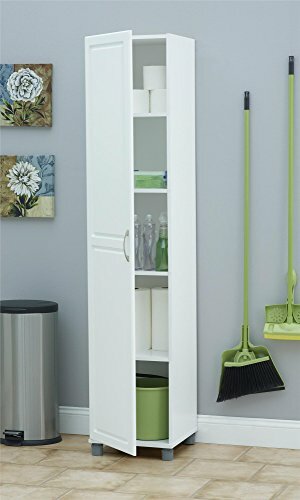 This 16” Storage Cabinet includes 4 shelves. Three of the shelves are adjustable so that you can space them to meet your storage needs. The 16” Storage Cabinet features a crisp white finish that creates a refined, clean look in your home. Use this piece as a stand-alone item, or combine it with additional SystemBuild Kendall storage items to create the perfect storage solution for your home. SystemBuild 16” Storage Cabinet requires assembly upon delivery.